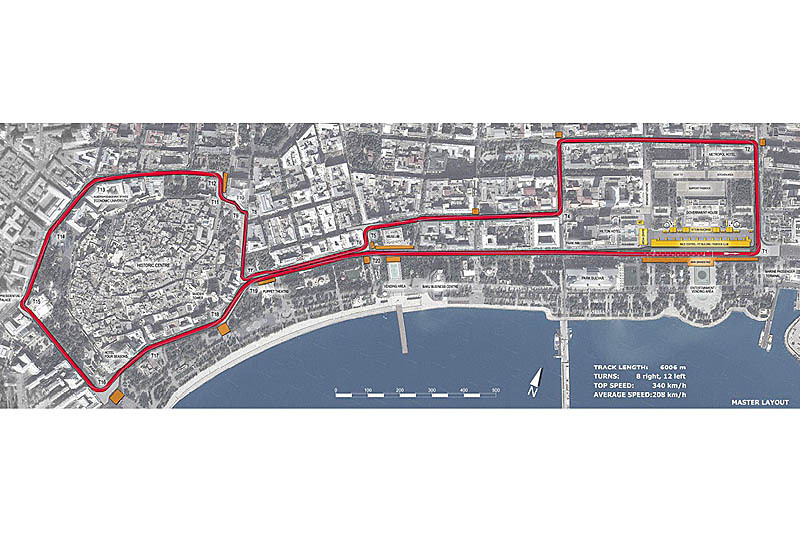 Bernie Ecclestone and Azad Rahimov, Azerbaijan's Minister of Youth and Sport, today unveiled the layout of the new Hermann Tilke designed Baku European Grand Prix street circuit at a special press event in Baku. The Baku European Grand Prix will take place in 2016 and today's event saw Ecclestone and Minister Rahimov presenting the layout of the street circuit that will see F1 cars racing through the streets of Baku. "Azerbaijan is the latest addition to the Formula One calendar and I am pleased to see they have designed an innovative new street circuit that will definitely help to create a world class event when we race there in 2016," said Ecclestone. "This is a very exciting milestone for everybody involved in the Baku European Grand Prix," added Rahimov, "and I would like to thank Mr Ecclestone for taking the time out of his very busy schedule to come and help us unveil the newest F1 circuit to join the world's most exciting sport. "We have been working very closely on the circuit layout with Hermann Tilke and his team since early 2013. Our brief to Tilke Engineering was simple - create a circuit that is unique, one that will help the Grand Prix in Baku quickly establish itself as one of the most exciting, thrilling venues on the F1 calendar, and one that the fans and teams alike are excited about. Most importantly, we wanted a track that would showcase the best of Baku, our capital city, and I am delighted that the circuit the F1 teams will race on in 2016 has achieved exactly that aim. "Now the next phase of hard work begins and we are all excited about seeing the circuit evolve over the coming months. We know there will be challenges, but with the support of Mr Ecclestone, Tilke Engineering and everyone involved in helping to create F1's newest Grand Prix, we know we will deliver a spectacular event in 2016 that will add to Azerbaraijan's well-earned reputation as a modern European country that is the perfect venue for the planet's highest profile sports and entertainment events." "I am absolutely thrilled about the Baku European Grand Prix project and delighted we can now unveil the track design," said Hermann Tilke. "We have created a challenging street circuit, in terms of engineering and design, and one that thrives on Baku's very attractive urban atmosphere and its great combination of history and 21st century style. The historic city centre, the beautiful seaside promenade and the impressive government house all combine to provide the perfect backdrop for a spectacular new track. "Obviously street circuits present a number of challenges, in terms of circuit design, but we have been able to incorporate some unique features that will provide the teams and fans with fascinating racing. 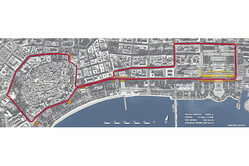 For example, there will be an extremely narrow uphill section at the old town wall that will reward pinpoint accuracy and courage, and we have an acceleration section of almost 2.2kms along the promenade which will see the cars running flat out at very high top speeds - something that will create an incredible spectacle for the race fans on track and the viewers at home." Anar Alakbarov, Executive Director of the Heydar Aliyev Foundation and the president of Azerbaijan Automobile Federation was also present at today's event. Mr Alakbarov said: "Formula One, the world's fastest motorsport championship is already very popular in Azerbaijan as a spectator sport. We are deeply honoured by the privilege awarded to us by the Formula One family in welcoming us to their party and enabling us to host the Baku European Grand Prix in 2016." "We are also confident that hosting this Grand Prix will act as a catalyst for the sport of Formula One in our country and I expect youngsters throughout the city will be so impressed by this spectacular event taking place on their doorstep that dreams of becoming the first Azerbaijani Formula One World Champion will take root." "Bernie racks-up another "trophy" GP in a state reknowned for its opposition to the democratic and entrepreneurial values that have allowed him, in the safety of the West, to accumulate a huge fortune....."
"When i first saw this, i smiled and than laughed so loud, because the track layout seemed strangley familiar to me. Herman Tilke design, LOL Find out here why, its a picture of a game i played back in the early 90s : http://i.ytimg.com/vi/RYMuVTzgI08/0.jpg"
"Why call it "Baku European GP" when it's nowhere near Europe? Last I checked, Azerbaijan was east of Turkey." Yes it is close to Europe, with one very small part on north on European continent actually, rest is in Asia. Weird but politically they are placed in Europe, just like Georgia and Armenia near by. 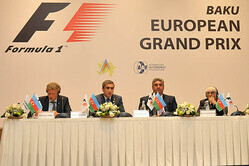 Why they didn't simply name it Azerbaijan GP? It might be one week difference with Russian GP, Sochi is close, not like Suzuka and Sochi, which are almost half way around the world." "Good to see another country with a rich history in motorsport being added to the calendar. I am sure that one of the old, established, european circuits will gladly give up their slot to accommodate such illustrious history. Thank goodness for Google Maps, I am not sure Mr. Ecolstone would have been able to even find the country without it, I know I couldnt. "My eyes not being what they once were; is that circuit to run anti-clockwise, a-la-Brazil? One longish straight followed by suburbia. Like Hungary, but without the scenic view. I wouldn't say it's the worst Tilke has come up, there are too many other contenders for that title. My gripe is that the race exists at all. I concur with Tom2681, the event will run for about 2 years, the population of the country will get bilked, some unelected official will get his (not her) face on TV, and then the event will get unceremoniously dropped. At least they won't have such a white elephant left over as do India, Korea, & Turkey taking up space. Bernie's recent track record of due diligence when picking "suitable" partners for race events (New Jersey and Brands Hatch spring to mind) gives me some hope that he's stuffed this one up too." "If the roads used for this version of the Baku circuit are similar to the ones used for the SRO GT3 races there, the "narrow uphill section" that is supposed to make for great racing be little more than an alley and leave no opportunity for even a very risky passing attempt." "Why call it "Baku Europan GP" when it's nowhere near Europe? Last I checked, Azerbaidjan was east of Turkey. Anyway: congrats to Bernie on finding yet another victim. Azerbaidjan will suffer the same fate as India, Korea & Turkey. He'll organize a few races in front of empty grandstands, bleed the hosts dry and move on to the next milking cow." The fascination of taking F1 to third world $hitholes ( apart from the poison dwarf increasing his $$$ ) is beyond comprehension." "..on a par with the highly dubious Russian GP, although even Russia has the pretence of a funding a team and a few drivers. Azerbaijan just stinks of Bernie feathering his nest further and a(nother) country paying handsomely to be seen to sit at the F1 table. And the multitude of. 90degree bends on that circuit layout remind me of Las Vegas." "SURELY.....there are OTHER circuit designers out there? "